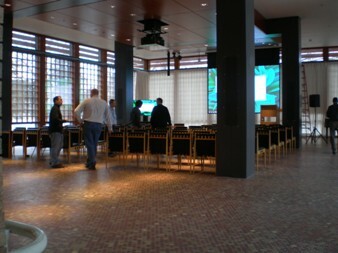 In the building of the German Embassy in Washington, D.C, and in the course of the general renovation of the building of the 1950s, audiovisual systems were to be newly introduced for the public areas used for events on the ground floor and basement. Wireless microphones support sound transmission via digitally controllable line arrays embedded in the wall. Video content can be reproduced on a large rolling screen using a motorized retractable video projector. Video and sound can be controlled via a small control room and occasionally transferred to adjacent rooms, or these rooms can be used independently.